Scones have quickly become one of my favorite things to bake. Part of it is nostalgia (my mom used to make my family scones every Sunday) and part of it is the simplicity. 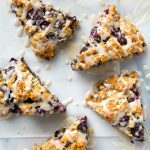 My go-to vegan scone recipe has less than 10 basic ingredients, requires only a few minutes to throw together, and takes under 30 minutes to bake up. It’s just enough flour mixing and dough-kneading to make you feel accomplished, but not so much prep/clean up that it feels like another to-do. The return on investment is high, plus you get to eat scones when all’s said and done. Most weekends my mom would make us orange scones, so for this latest recipe rendition I followed her lead and also went super classic: cranberry orange scones. It’s tricky to find fresh cranberries this time of year, and I prefer dried anyway. The key is to buy dried whole cranberries, not pieces, to get both the chew factor and some softness. Lately I’ve been making my scones with a small amount of buttery spread, although unrefined coconut oil also works well if you want to keep the ingredients on the less processed side. If you buy apple juice-sweetened cranberries this recipe is completely refined sugar-free, but I topped this batch with an orange flavored powdered sugar glaze that was too good to pass up. All things in moderation, right? If you’re gluten-free, I’ve had good results swapping out the all-purpose flour for this gluten-free baking blend. You can mix your scones by hand and get in a decent arm workout, or do what I do and let your stand mixer (with the paddle attachment) do all of the heavy-lifting. The dough will be super thick and a little crumbly, so if you do mix it by hand, you may find you need to work in a tablespoon or so of extra almond milk. 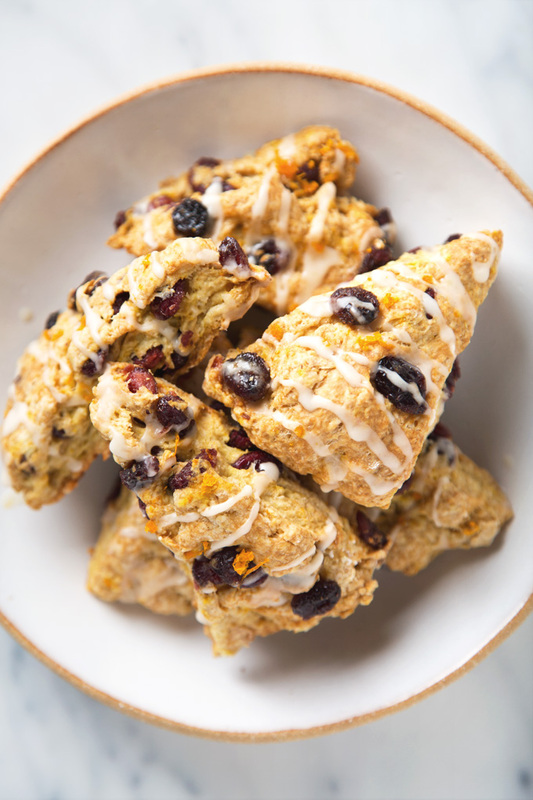 Simple vegan scones that are studded with chewy dried cranberries and scented with orange zest. 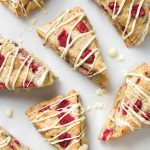 These cranberry orange scones are lower fat and sweetened using only fresh orange juice (no added sugar!). They're a great beginner recipe if you've ever felt intimidated about baking your own scones at home. 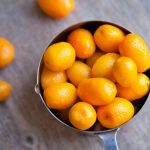 In a small bowl, whisk together the almond milk and orange juice. Allow to sit for 5 minutes. Make a well in the center and add in the almond milk mixture, orange zest, and vanilla. Mix until a slightly sticky, very thick dough forms. Fold in the cranberries. Be careful not to overwork the dough. Transfer the dough to your prepared baking sheet. Lightly dust it with flour, then form it into an 8-inch round and cut into 8 parts, leaving space between each so all sides can brown. Bake for 25-30 minutes, or until golden and no longer doughy. Allow the scones to cool on the baking sheet for 10 minutes, then transfer them to a wire rack to cool completely. While the scones cool, make the glaze: In a small mixing bowl, stir together the powdered sugar and orange juice until no lumps remain. 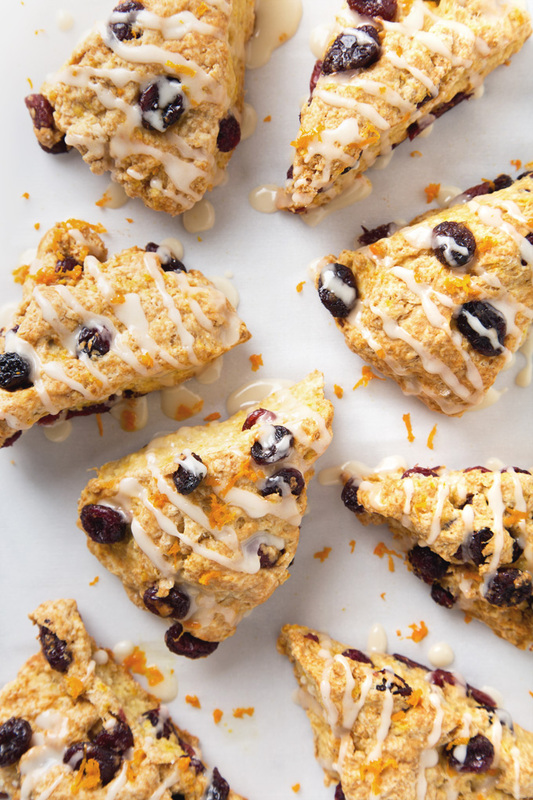 Drizzle the scones with the glaze, sprinkle with orange zest, and serve. Girl, you are the scone QUEEN! haha I made your blueberry scones, then the vanilla spice, and now I can’t wait to make these cranberry orange ones. Your recipes never fail me! That’s such a nice a compliment! haha I’m so happy you’ve been making (and loving!) 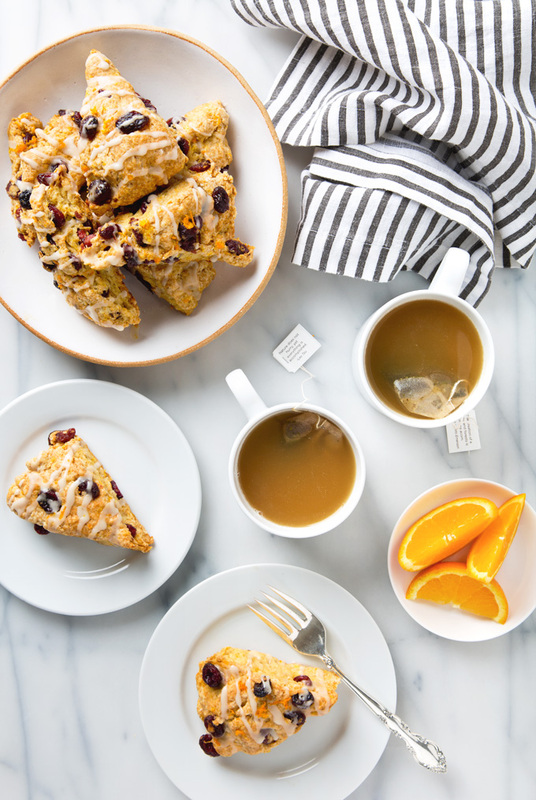 our scone recipes. These are in the oven as I type this. 🙂 I read your post, realized I had everything to make them and got to work baking. Very easy even for this non-baker! I do! And I’m betting blueberries + orange will work well together too. I love homemade scones! 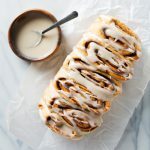 I usually top mine with cinnamon sugar, but I’ll have to try your orange glaze next time. Sounds amazing! The orange glaze is so good…I have to resist eating it with a spoon. 😉 Cinnamon sugar also sounds wonderful. I made these with my daughter as an afternoon activity when she got home from preschool. I set out the ingredients, then let her help me measure and mix. She loved the mixing part and made quite the mess! Nevertheless, we both enjoyed making them and they turned out great. Thank you for this! That is the sweetest little afternoon project—I love it!